Industrial high pressure blowers, centrifugal and axial fans, high temperature ventilators. 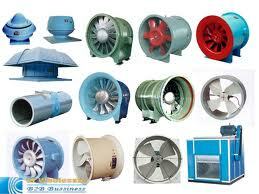 Sales of industrial roof and wall exhaust and supply fan blowers, radial blower fans, vaneaxial ventilators. - Aluminum, stainless steel and alloy construction available. Air fans, blowers and ventilators for industrial plants from Buffalo, New York. Sales of industrial axial power roof and wall ventilators, exhaust and supply centrifugal spun aluminum fans and blowers.